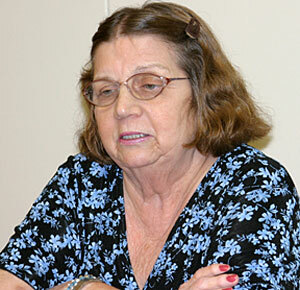 Crystal Lee Sutton is the woman on whom the Oscar®-winning movie Norma Rae was based. Sutton’s role in the history of labor is assured. In the early 1970s, Crystal Lee was 33 and working at the J.P. Stevens plant in Roanoke Rapids, N.C., where she was making $2.65 an hour folding towels. The poor working conditions she and her fellow employees suffered compelled her to join forces with Eli Zivkovich, a union organizer, and attempt to unionize the J.P. Stevens employees. 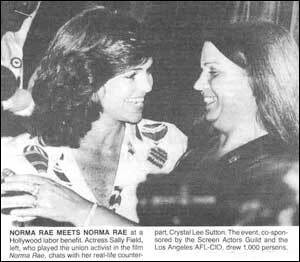 Crystal Sutton with actress Sally Field who played Norma Rae, at a Hollywood labor benefit. "We admire her courage, we admire her convictions, and we admire her spirit. She is a champion not only of the working class but also of all who inspire to improve the lives of others." – Dr. Martin H. Nadelman, President of Alamance Community College. The words describe Crystal Lee Sutton, the woman on whom the Oscar-winning movie Norma Rae starring Sally Field was based. She died on Sept. 11 following a long illness. Read more about Crystal Sutton in her biography. View the items Crystal has collected over the years. Get information about the inspired movie and watch brief videos from the movie.